Conscious sedation will allow you to feel more relaxed and sedated during dental procedures without the risks of being fully put to sleep. An oral sedative can be prescribed to be taken an hour prior to the appointment so you will be well relaxed by the time your appointment starts. Laughing gas can also be used on its own or in addition to the oral sedative to enhance its calming effects. As with any time you are in our office, we’ll ensure that you are feeling comfortable for the duration of your procedure, and will monitor your vital signs making adjustments as necessary. 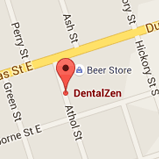 For more information please contact our office at 905-668-5815 to discuss your needs with one of our DentalZen team members. If you require a deeper sedation DentalZen also offers IV sedation that will put you into a further relaxed state during your procedure. Very often when you awaken you will have no memory of the procedure itself. You will be in a ”twilight” state but remain responsive to requests and questions asked. You will be able to move your head on demand and inform us of any discomfort felt, all while feeling deeply relaxed and sedated. When using IV sedation, it is necessary to have a family member or friend bring you and take you home from the procedure. It is important to take is easy and have someone with you until the anesthesia has fully passed from your system.